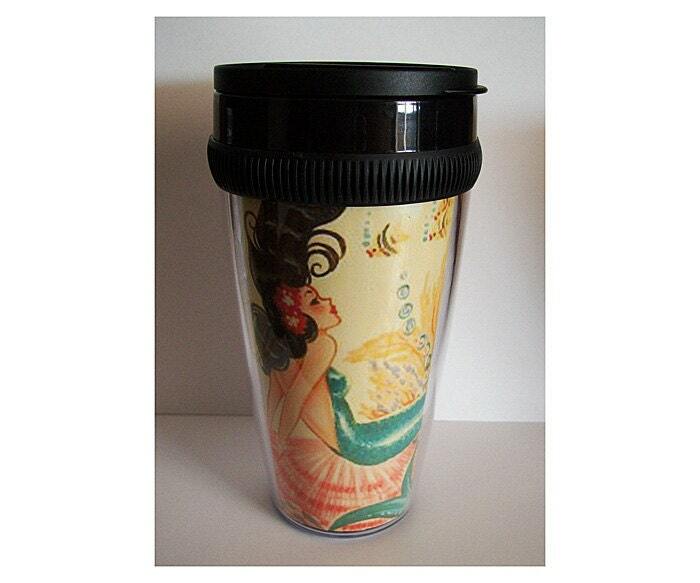 Tote your hot or cold beverages around in style with this heavy duty plastic travel mug covered with vintage 1950s era pin up mermaids and nautical imagery. This coffee cup will carry 12 OZ. of your drink of choice and is hand washable but please don't put in the dishwasher. The mug is made with paper inserts that I laminate with a hot lamination system so they will be waterproof for years to come. I can also make mugs out of most of the images on my other products so if you dig robots, Mexican wrestlers, pin up girls and other such retro gems please peruse!